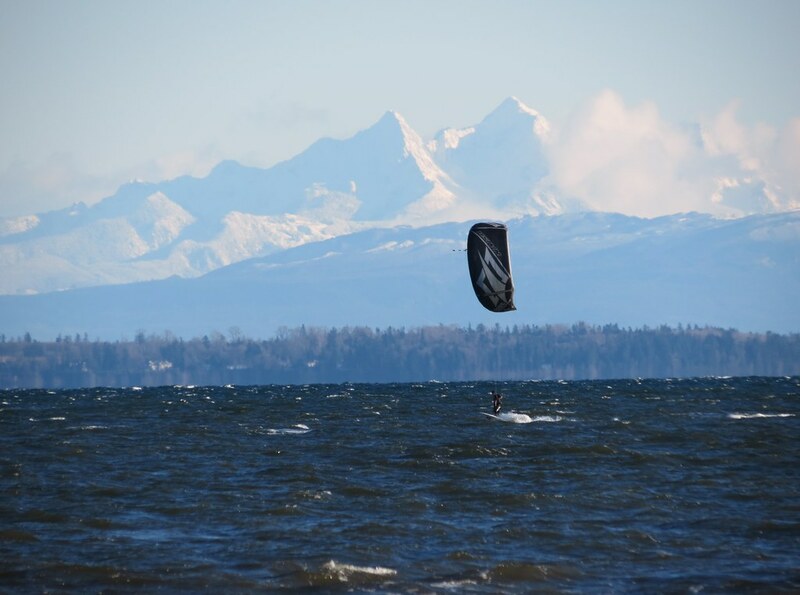 Centennial offers up more days of storm sailing than any other spot in Metro Vancouver, but isn’t as frequent as spots on the Island (Columbia and Comox) or spots to the south (Locust and Whidbey Island). Southwest (gusty, side-offshore wind that can allow down-the-line rides further offshore). 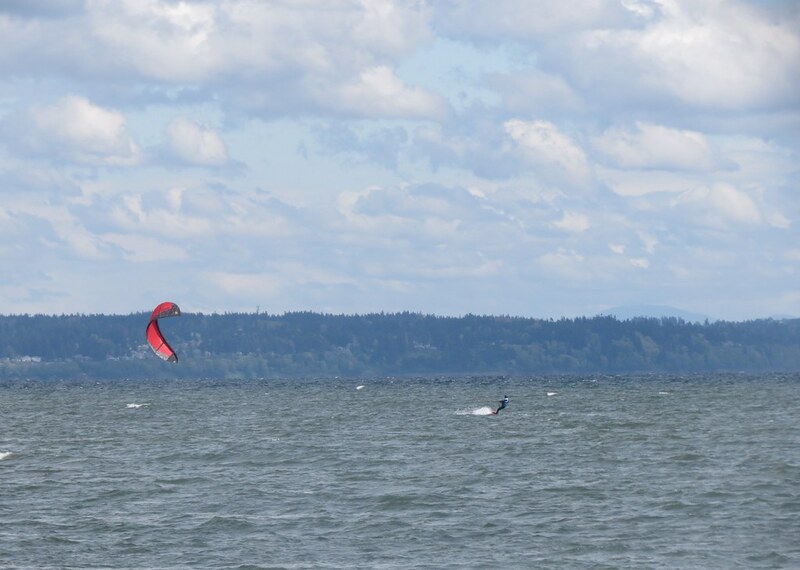 Centennial often creates more of a crumbling wind-blown wind swell than a wave, although clean standing lines of waves can be presented and these are more common on the second bank (outer) bank of Boundary Bay. 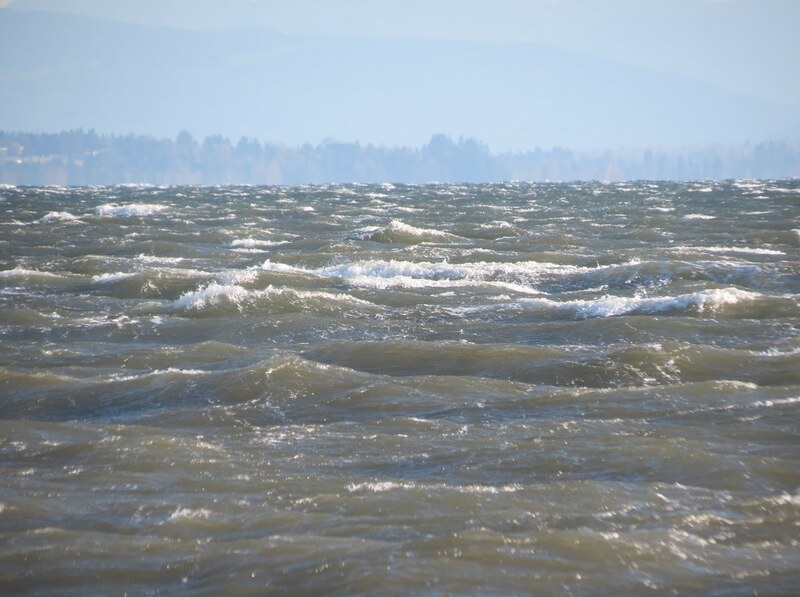 On winder days the waves at Boundary Bay are generated by the rolling swell from the deeper water breaking over the shallow flat benches of sand. Understanding the shape of the benches of sand in Boundary Bay helps to understand the water conditions. 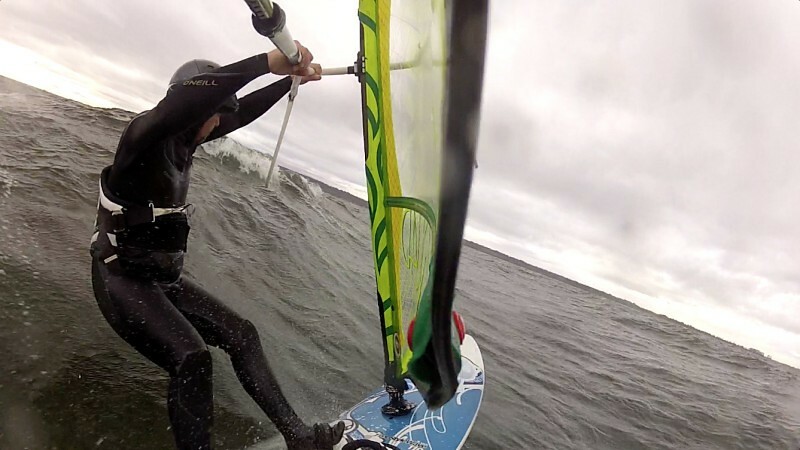 Regardless of which launch you choose, the water conditions (wind swell/waves/ramps) often get better (bigger wind swell/waves/ramps) the further you go out until you hit the edge of the second bank and here they turn into deep water rolling swell. That’s why it is so hard to get a picture of what it feels like out in the ‘good stuff’, because it is so far out! The best water conditions (wind swell/waves/ramps) seem to show up when the tide is about 3 m or higher and there is more water pushing over both banks. The water conditions can vary greatly from launch to launch on any given tide, but in general the nicest wind swell/waves/ramps can be found between 3rd Street and the boat launch. Even on the same day the difference between Maple Beach, the boat launch, 3rd Avenue, 4th Avenue and Centennial Beach can be dramatic. Inside (over the first bank) waves are generally good jumping ramps (short and steep) that sweep toward you in the side-onshore wind, but they are not really fast enough or organized enough to ride – they crumble (pitch, peak, sluff, and reform but do not really break, close-out or dump). Inside (over the second bank) the wind swell is more wave-like (there are often tightly spaced standing waves in lines over sections of the second bank, depending on tide depth, tide direction, and wind/wave angle). Ramp shape over the first bank on a shallower tide can often be quarter-round “C” shaped and taller, more vertical (or wall like) on the second bank. Jumping opportunities abound (with larger flat sections between waves at Centennial allowing you the opportunity to build speed) with waist to shoulder high ramps common on ‘good’ days. If you enjoy jumping starboard, this is the spot for you! Ramp/wave spacing is often greater off Centennial (there are often larger flat sections between ‘ramps’) and grows tighter the further south you go and they can be very tightly spaces at 3rd Avenue in certain conditions. 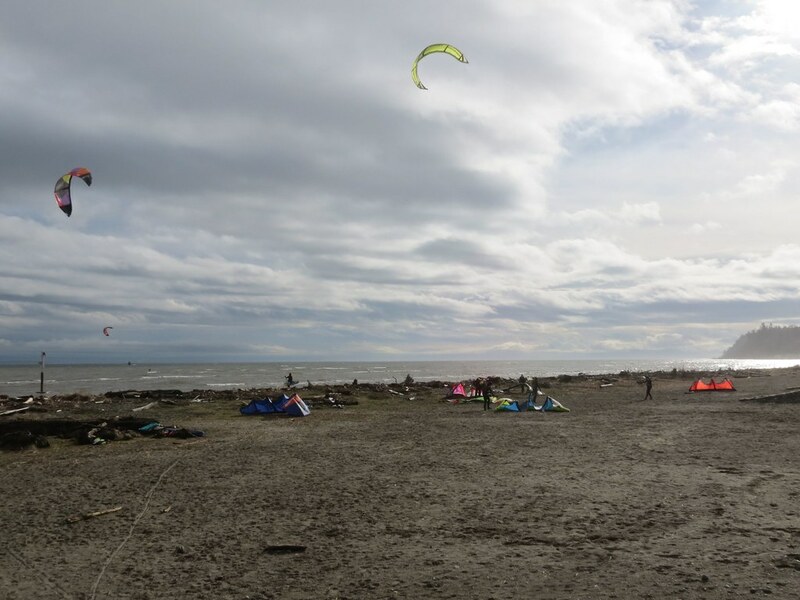 The ramps at Boundary Bay are large enough and steep enough for windsurfing back loop at 3rd Avenue – Daniel (DD) was seen to land two in one session (one he didn’t sail away from, but they were both pretty impressive). Even when 3rd Avenue sets up ‘just right’ you may have to watch for a ride out over both banks to get one wave face to stand up and say ‘back loop please’. Outside swell can be moderate to large rolling swell – similar, but rounder than the deep channel at Acadia with jumping to starboard and port (if you drive to windward). On a east wind the bay tends to stay flatter, but with stronger wind on a higher tide some decent chop and small waves can begin to roll. 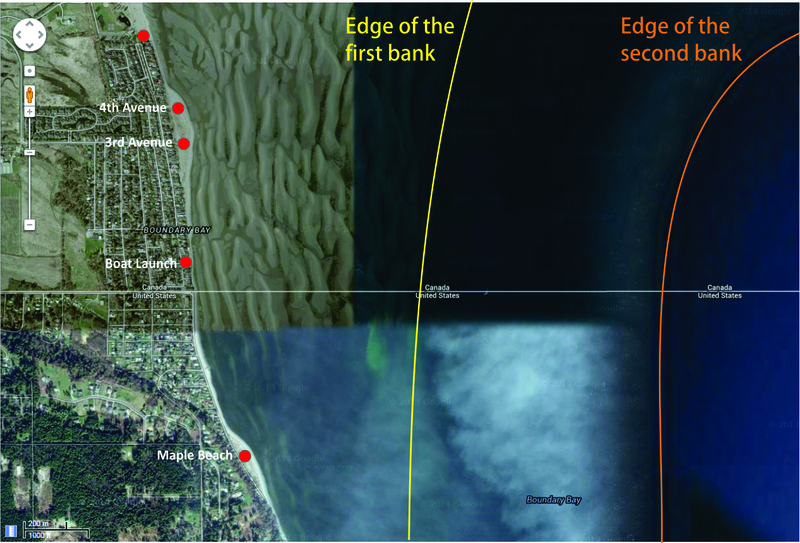 The bay is about 11 km wide between Centennial and Crescent Beach in White Rock and Maple Beach is over 2 km south of the launch at Centennial, so there is lots of open water. For those that want to cruise around a sail south (upwind) to Lilly Point (4 km south of Centennial) can prove to be fun adventure in steady wind and with a complimentary wind/wave angle. 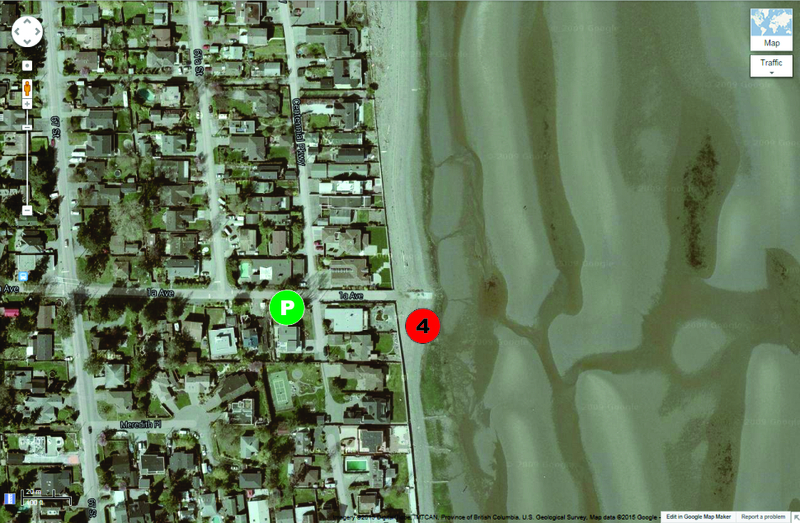 It is possible to sail Boundary Bay on any tide height – it’s just a matter of how far you will have to walk to reach the water. But at Centennial it can be a LONG walk on lower tides! I couldn’t find any example pictures – the water must have been too far away! Alton once mentioned that these tide heights are “predicted”. This is an important point as I have noticed that tides that are “predicted” as higher can seem lower and tides that are “predicted” as lower can seem higher (almost a meter different). This sometimes means you are walking out or home when there was ~3 m “predicted”. Centennial is the largest of these beaches, followed by Maple Beach, 3rd, 4th (which really is the northern end of the point at 3rd) and the boat ramp (which is quite narrow). On a mid to low tide all of the beaches are connected by the sand of the exposed first bench. The default view is near the boat launch, the camera is about 10 houses north of 1a Ave and you can see the boarder marker on the right out in the bay. 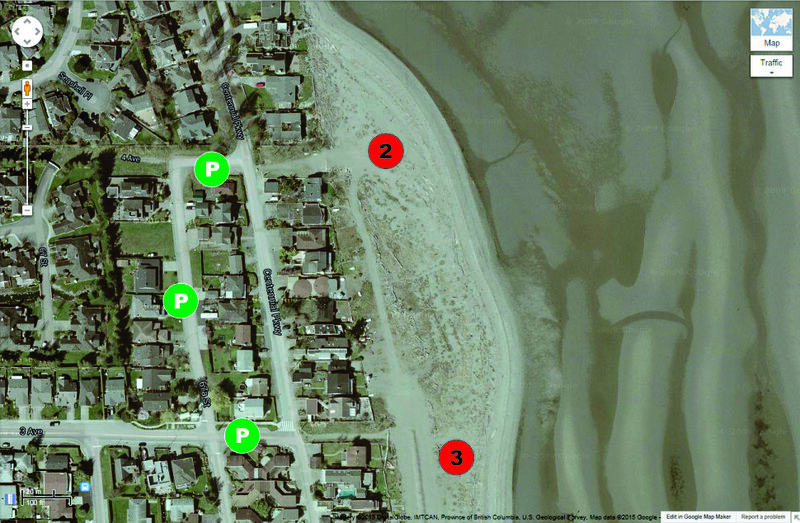 Views North 1, 2, 3, and 4 pan north up the beach with 4 being the closest to the Centennial Beach launch. Thanks to the early Boundary Bay pioneers. Thanks to Alton, Daniel, Elliot E, Jerry and many others who shared the water and their local knowledge in my early sessions there. 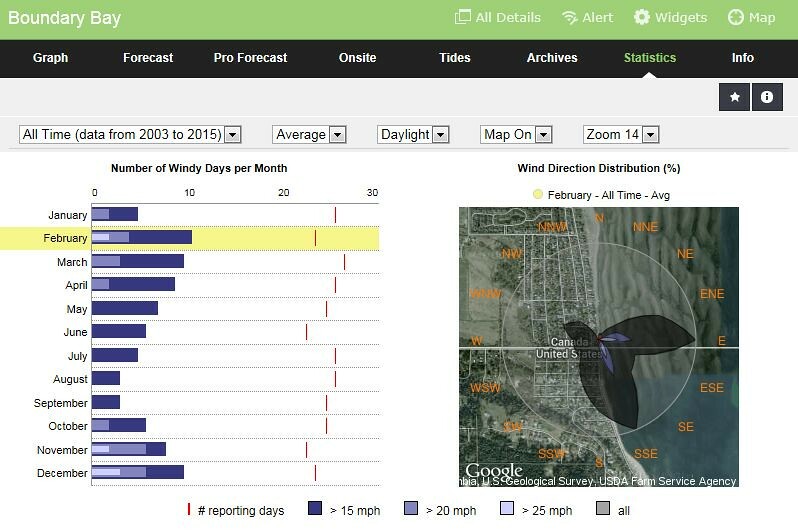 Thanks to Michael who worked with iWindsurf/iKitesurf to have the Boundary Bay sensor reactivated after the Bayside Squash Club changed ownership. Last edited by C36 on Fri Sep 21, 2018 12:49 pm, edited 18 times in total. Thanks Dave! Love that shot of Elliot! C36, Thanks for all this info. I'll print it. 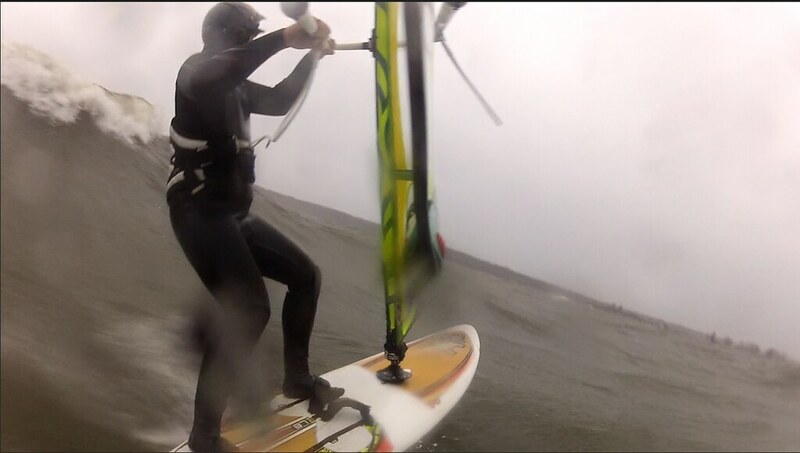 All this helps as I should start getting serious about windsurfing . 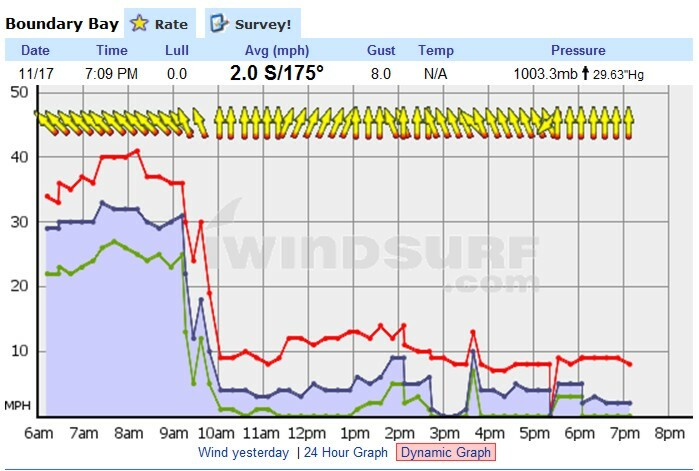 There should be a direct link on the menu of this website detailing different aspects of SUP, Windsurfing, Kiting, Surfing locally like the post you wrote (a wiki article)... so it does not disappear buried in other posts. People are making the same mistakes locally choosing to drop the sport altogether for the lack of proper info ... the more information the better, the more people in the water the more awareness about keeping our local waters healthy (surfing with lion's gate primary treatment close by, on outgoing tide has made me sick a few times, kiters too). Michael wrote: Thanks Dave! Love that shot of Elliot! Glad you like it M. I like that shot too! Glad you like them Richi! I appreciate the kind words, although technically I think http://www.wtfbc.ca is the publisher. There is - as each of these are posted Alton has very kindly been pinning them to the top of the "general" discussion page and adding links on the right side-bar menu (shown on all pages) at the bottom under the "Sailing Site Info" heading. gabrielb wrote: ...People are making the same mistakes locally choosing to drop the sport altogether for the lack of proper info ... the more information the better, the more people in the water the more awareness about keeping our local waters healthy (surfing with lion's gate primary treatment close by, on outgoing tide has made me sick a few times, kiters too). That is the reason for doing it - to help share the info and encourage more people to participate. Well done! Many hours must've gone into that for sure! What's the consensus on which tide station to use for centennial? I've always used White Rock but I could see some people using tsawwassen instead. 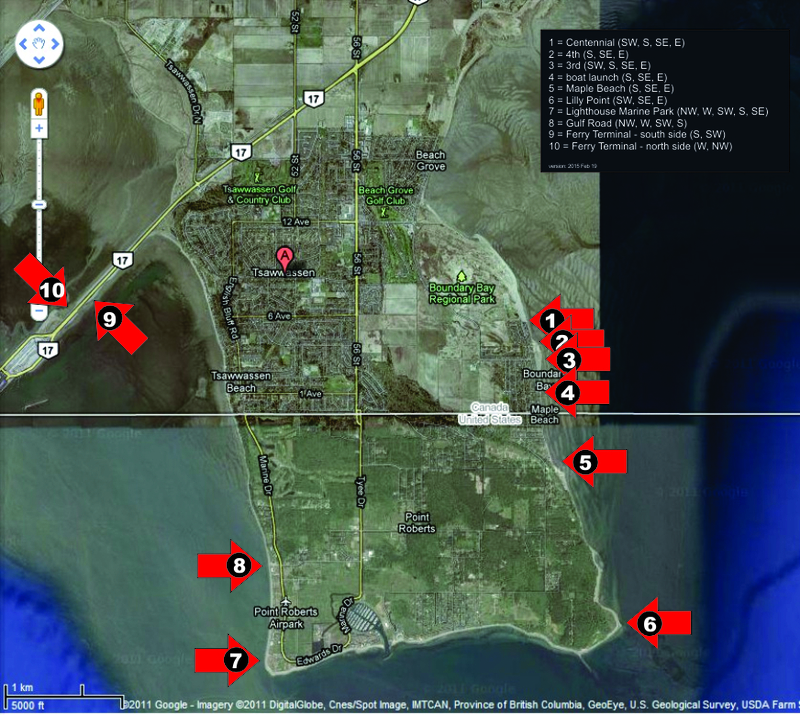 Comparing them today I see tsawwassen can read a full 0.3m higher than White Rock. 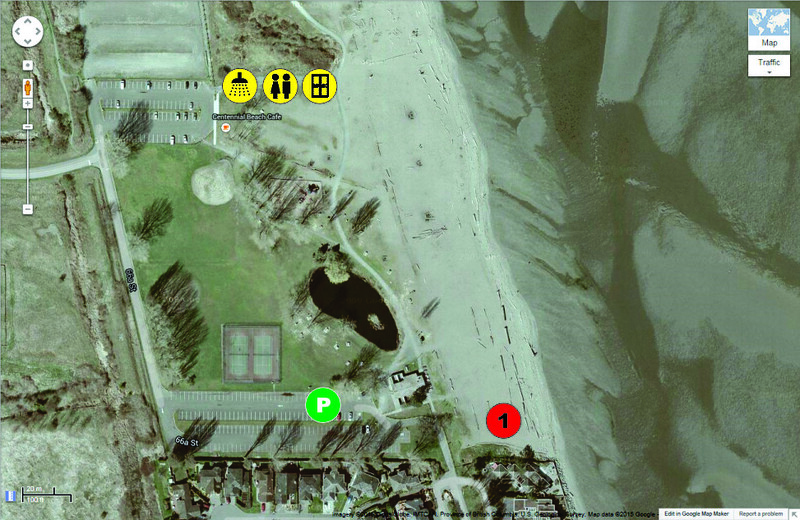 Slappy wrote: What's the consensus on which tide station to use for centennial? I use the Tsawwassen one. I keep all my records of the best tide setups I've sailed over the years with that one and know how it relates to Boundary Bay best. I also like to check the webcam as a reference. They are just an estimate and sometimes vary from time to time. ShonanDB wrote: I sailed at Lighthouse Park in Point Roberts on a SE one day 2 years ago near low tide (ebbing) as I didn't want to walk from 3rd and it was decent. I was sailing parallel to the Southern beach between the Lighthouse and the Marina and once in a while a few sets that wrapped around Lily Point would come through at 90 degrees. On the West side of the point there were waist to chest high well spaced rollers coming through and some breaking waves to jump right at the point. Much better than flat water at Tsawwassen.